I never stop being amazed at how weird chickens are. I’m not sure I’d go so far as to call them stupid, because I really don’t know that they are any smarter or dumber than they need to be. They do things that are seemingly intelligent from time to time, such as hiding from hawks or huddling in the coop during a storm. Then, at other times, they do things that I find utterly bewildering. Like this morning. In the past, our chickens have laid their eggs in the chicken coop. While that still might happen occasionally (and, I’m certain, accidentally), the vast majority of the time, we will find our daily clutch of eggs atop a hay bale in the garage. The ladies actually wait on line for this spot as though they are not allowed or capable of laying elsewhere. This is clearly the only place for egg laying on our two-acre farm. Except for the mud room. After realizing that the chickens were going to lay their eggs wherever they damn well pleased, we decided to at least encourage them to do it where we might find them, as opposed to out in the woods or in the pig enclosure. 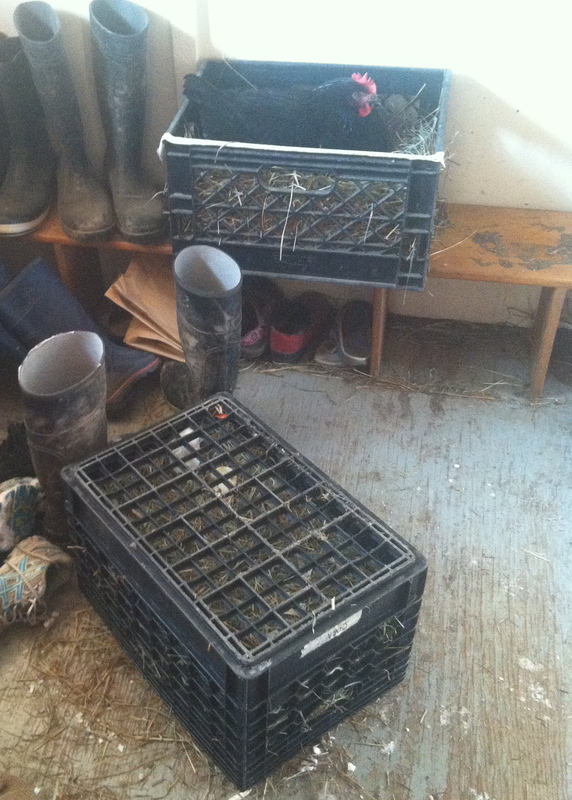 In that spirit, we put two hay-lined milk crates in the mud room and, briefly, had created a popular spot that was pretty much egg delivery for us–all we had to do was step out the front door and gather eggs. 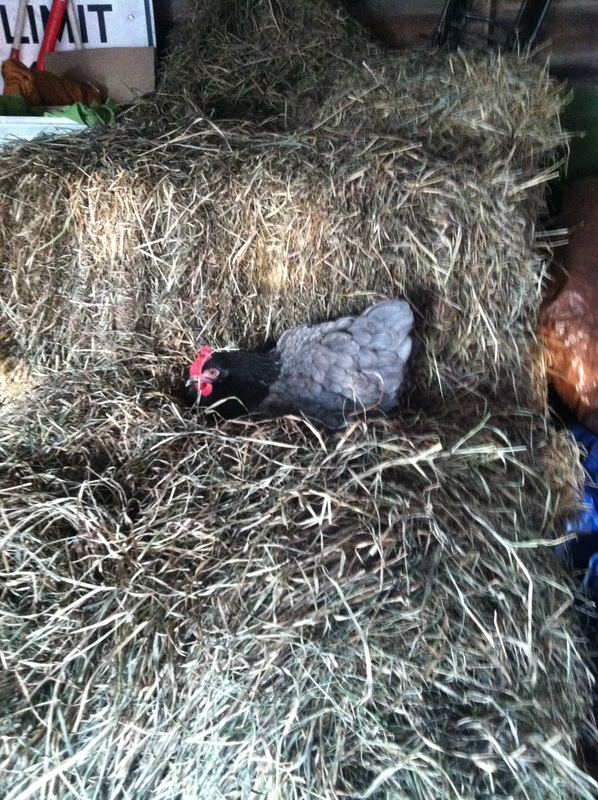 While the garage hay bale has taken pride of place, we still have one or two hens that prefer the crates. The only drawback to the crates is that we’ve never properly secured them. The shelf upon which they sit is slightly narrower than they are so, when a hen hops up on the outside of one of them, it can tip over and fall to the floor below. We’ve tried a few half-measures to fix it, but we usually just right the fallen one and go about our day. Today, a hen was squawking and carrying on for longer than usual and I finally looked out to see what was the matter. I saw one overturned crate and one with a hen sitting in it. Not thinking much of it, I lifted the overturned one to put it back, only to find a chicken trapped underneath. 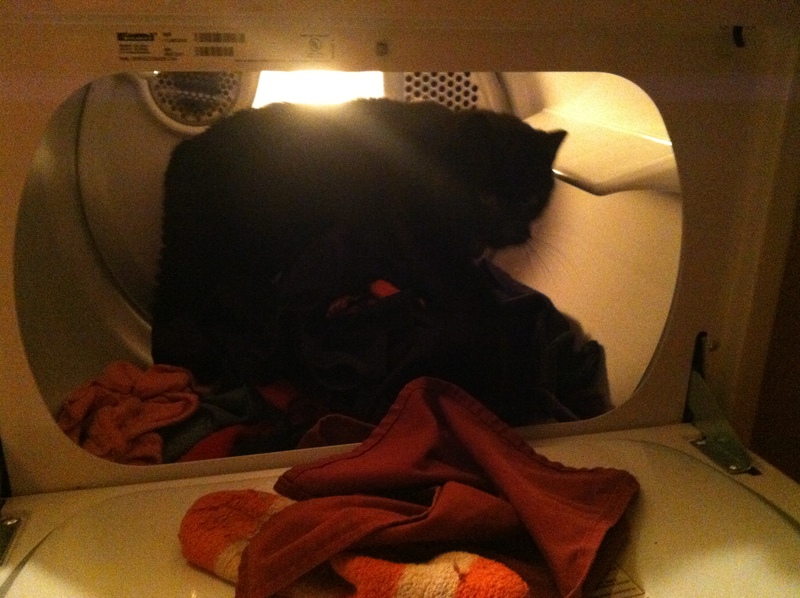 This comes on the heels of finding one of our barn cats in the dryer last night while I was folding laundry out of it. I’d opened the dryer, started folding, and walked away for a moment to check on something else. I returned and continued folding, noticing that each time I grabbed an article of clothing it really seemed like something was moving in there. I looked in to see what it was and found the cat getting ready to settle in for the night. So, my goal today is to keep the chickens and cats from trapping or killing themselves inadvertently as a result of my marginal awareness of their needs. This entry was posted in Uncategorized and tagged applewod farm, cats, chicken coop, chickens, dryer, egg delivery, egg laying, free-range chickens, hay, hay bales, milk crates, mud room, squawking. Bookmark the permalink. 2 Responses to Seriously, Chickens? Our chickens all lay in one or two of the nesting boxes. There are plenty of them and they could easily spread out, but they do exactly what yours do: line up and wait their turn for the premier box. So strange.